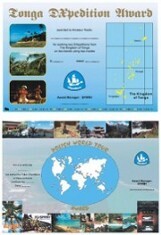 Applying for "expedition" Awards you support next Dxpedition ! Award Manager in certain conditions can ask for original QSL cards. 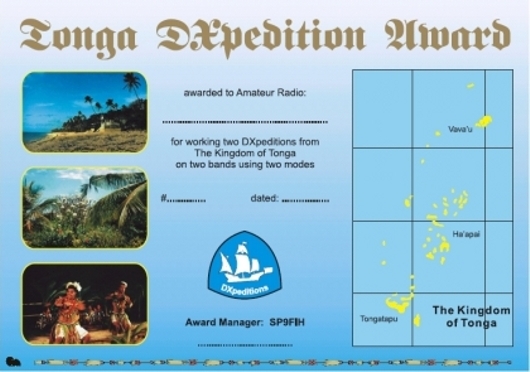 The cost of Tonga DXpedition Award is 5 Euro for Europe and 6 $ or 6 new, valid IRC coupons for the rest of the world. Mail is included in fee. Award Manager in certain conditions can ask for original QSL cards. 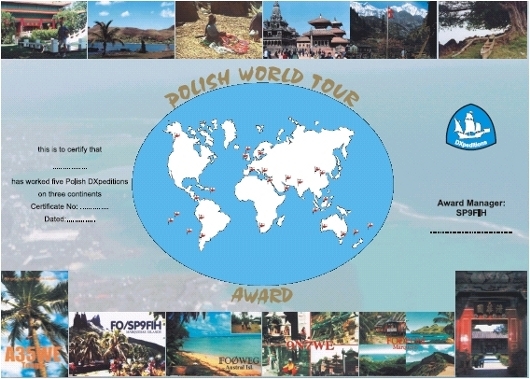 The cost of Polish World Tour Award is 4 Euro for Europe and 5 $ or 5 new, valid IRC coupons for the rest of the world. Mail is included in fee.